4 Wheel Rollator, Lightweight Folding Red Aluminum Frame, 6" Caster Wheels, Adjustable 32" to 37"
Manufacturer #146- R726RD Brand McKesson Manufacturer Drive Medical - McKesson Application 4 Wheel Rollator Base Depth 20 Inch Base Specification Loop Locks, Serrated Breaks, Zippered Pouch, Carry Pouch, Removable Backrest, Padded Seat Base Width 24.5 Inch Color Red Depth 12 Inch Frame Diameter 1 Inch Frame Material Aluminum Handle Extension Size 32 to 37 Inch Handle Height 32 to 37 Inch Height 32 to 37 Inch Inside Grip Width 19 Inch Maximum Patient Weight 300 lbs. Seat Height 20 Inch High Seat Type Folding UNSPSC Code 42211506 User Adult Weight Capacity 300 lbs. Wheel Type 4-Wheel Latex Free Indicator Not Made with Natural Rubber Latex. 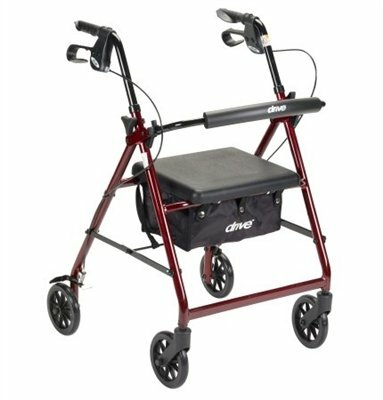 Features The McKesson Lightweight Aluminum Rollator manufactured by Drive Medical has aluminum frame construction that safely supports up to 300 lbs. with style. 13-pound, lightweight design with folding capabilities for easy storage and transport. Ergonomically-designed, tool-free handles are easy-to-grip, reduce hand pressure and adjustable to accommodate users' height and preferences. Wide, padded seat and backrest made of strong polyurethane material for durability, soft and contoured for ergonomic comfort, as well as, seamless and cut- and split-resistant to prevent rubbing and irritation. Hinged, padded backrest can be folded up, down or removed. Deluxe loop-lock system operates like a bicycle hand break to slow down or temporarily stop and easily lock into stationary position by pushing handle into down-position. Swiveling, 6-inch caster wheels with soft-grip tires are non-marking and add stability and control for ideal indoor and outdoor use. Serrated-edge brakes provide firm hold. Includes convenient, zippered storage pouch on the bottom of the seat and spacious, vinyl carry pouch below for transporting personal items with added privacy and security. Actual product may vary from image. See product specifications for more detailed information. Packaged: 1 Each.